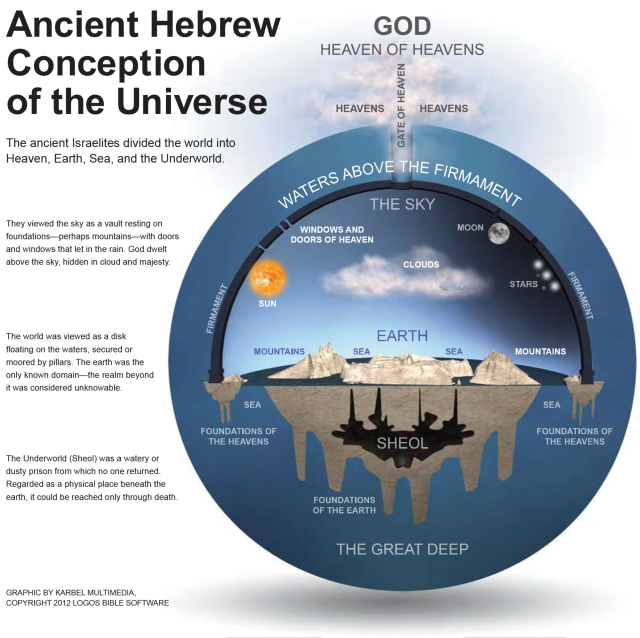 Many evangelical Bible scholars accept that the ancient Hebrews viewed the world as a disk floating on the waters, supported by pillars. But does this mean that God’s Word is “teaching” us today to believe in a “flat earth?”…. Apparently, some people think so… This is pure crazy talk. (credit: Logos Bible Software, the FaithLife Bible). I keep hearing about this stuff, so I decided to check it out. Apparently, there is a tiny yet growing movement of Christians who believe that the earth is flat. My cringe-worthy meter just went to the red zone. What really bothers me about this stuff is that these so-called “Flat-Earthers” use much of the same rhetoric I hear used by other Christians to defend their view of the Bible. These overlapping talking points are disturbing, when you translate what those talking points mean to flat earth advocates. “If you believe the Bible is inerrant, then you must believe everything it says about scientific matters, such as the [flat earth]” (translation: Scientifically, Christians should believe in a flat earth because the “Bible teaches it”. The “Bible teaches” a flat earth, because we said so. ). You can pretty much replace “flat earth” above with just about any supposed “scientific teaching of the Bible,” that rips the Bible out of its historical context, and get the same result. Folks, we need to set the record straight. With very, very few exceptions, no Christian through the course of church history believed that the earth is flat. Historian Jeffrey Burton Russell painstakingly has shown the idea that Christians have believed in a flat earth to be an invention of modern thinkers, over the past couple hundred of years. Christians are not the only ones who have bought into this type of nonsense. As one of my “favorite atheists” Tim O’Neill puts it, a lot of atheists buy into this garbage as well. Some ancient cultures did subscribe to flat earth cosmologies, arguably including the Hebrew culture. But certainly by the early years of the medieval church, such views had died out. Overwhelmingly, Bible scholars today contend that neither God, nor the human authors of the Bible themselves, were trying to teach science, with respect to a flat earth cosmology, back in the ancient era, nor should we try to apply such logic today to our cosmology. Sadly however, some Christians today think they know better, and perpetuate misinformation. Columbus was not trying to test the idea that the earth was flat, by trying to sail around the world. Columbus, just like any other medieval European, believed that the earth was spherical. That old canard was an invention in the mind of writers like Washington Irving (ever heard of “The Legend of Sleepy Hollow?”), and propagated by such thinkers as John William Draper and Andrew Dickson White, in the late 19th century. For some strange reason, the Internet has made it possible to revive these ideas, and a growing number of Christians are buying into this. I would not even bother with “Flat-Earth Christianity,” except that it raises serious questions that Christians should consider. For example, flat earth rhetoric mimics a lot of the talk I hear coming out of the Young Earth Creationist movement. Thankfully, Young-Earth Creationist groups like Answers In Genesis have wisely tried to put the “kabash” on such wild-eyed thinking. Thank goodness! But the “cringe-factor” gets elevated at times when both “Flat Earthers” and Young-Earth Creationists start talking alike. To be clear, though I am not persuaded myself, I am all for the possibility that the earth is indeed young. God could have created the earth any way He wanted, during any time frame: 6,000 years ago, according to the traditional view, or 4.34 billion years ago, according to the contemporary scientific consensus. But when some Christians resort to a rhetorical style of argumentation, with examples like what I gave above, that equates their own interpretation of Scripture, with the authority of the Bible itself, then that is manipulative at worst, or just plain idiotic at best. 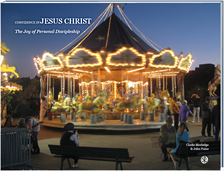 Responsible Young Earth proponents may make the philosophical argument that the character of the Creation story, in history, is such that our current scientific knowledge can not adequately describe what happened in the past. Old Earth Creationists reject this view, arguing in favor of the scientific consensus, that the present indeed is the key to understanding the past. But no matter how one views the past, this is all very different from our ability to make scientific observations here in the present. And this is where flat earth thinking goes completely awry. Did you know that Antartica is the boundary around the disc of the flat earth? All of those pictures of a spherical earth, from outer space, are lies created by NASA! Why do transatlantic airplane flights travel north over Newfoundland, or even as far as Iceland, when going to Europe, instead of going directly across the Atlantic Ocean, according to the flat earth model? Do not buy into the “fake news” that they are trying to save fuel. What they are really doing, is that the airlines are all in league with NASA to keep us in the dark about the “truth” of the flat earth! The word “NASA” means “to deceive” in Biblical Hebrew (… actually, it is a transliteration from Hebrew into English, of the word “nasha,” which means “to deceive,” but hey, “nasa” and “nasha,” that’s close enough, right?). Yup. It is that silly. OK. It can be really tough for scientifically-trained people to accept a Young Earth, but this “Flat Earth” businesss goes way beyond the age of the earth issue. It is bad enough for some Christians to still argue that Copernicus and Galileo were wrong about the non-stationary characteristic of earth, and favor the older, Ptolemaic view that the earth is a fixed object in space, where the sun, and all of the rest of the stars and planets revolve around the earth. But to claim that the Bible teaches a flat earth, when only an obscure handful of Bible interpreters, mostly within the early years of the church, have ever made such claims, only to be refuted by others long ago, is an example of “the-Bible-says-it–I-believe-it–and-that-settles-it” type of thinking gone off the rails. Amazing. Perhaps you have seen enough already (If so, stop reading at this point, and save yourself some time)…..
Folks, the propagation of such nonsense only casts ill-repute upon the Gospel. It is time to set such bad Bible interpretation aside, and read the Bible responsibly. I will have some follow-up posts on related topics, but this really gets my goat. This entry was posted on Saturday, November 17th, 2018 at 9:00 am	and tagged with flat earth, Young-Earth Creationism and posted in Topics. You can follow any responses to this entry through the RSS 2.0 feed.